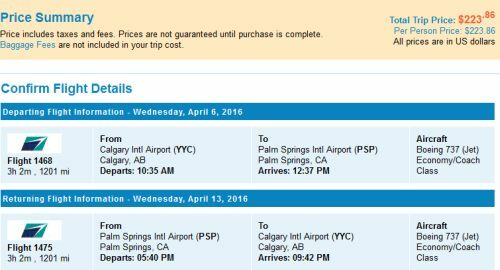 WestJet is showing some cheaper non-stop flights from Calgary to Palm Springs, California for $299 CAD roundtrip including taxes. 3. The price will come up as $223 USD roundtrip including taxes on Priceline which will work out to $299 CAD, when booked with a Canadian credit card, after factoring in the exchange rate fee. Calgary to Palm Springs, California - $225 CAD roundtrip including taxes | non-stop flights, new record! calgary, yyc, united states, westjet, california, palm springs, psp and north america.